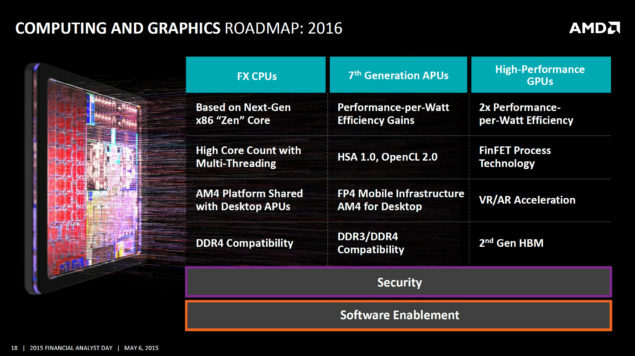 AMD has officially confirmed their x86 Zen core architecture at the financial analyst day but that isn’t the only thing they confirmed. 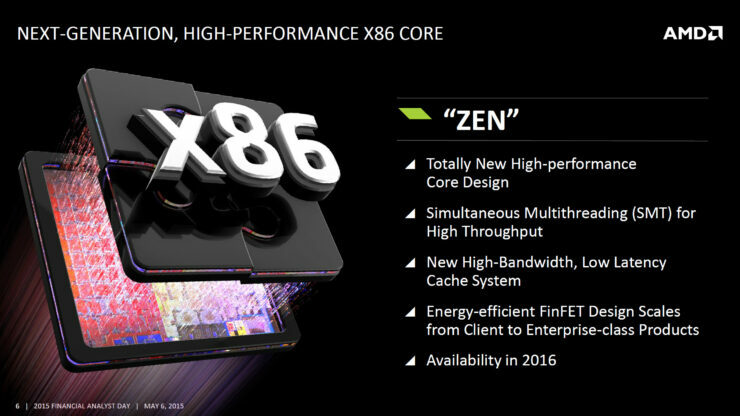 Along with the announcement, AMD also confirmed the products which x86 Zen would be fused inside and they all point to faster enthusiast based FX CPUs and next generation APUs which will be featured across one scalable platform on a new socket known as AM4. AMD has confirmed that they are developing a new lineup of modern FX CPUs which will replace the age old Vishera APUs based on the Piledriver core architecture and available on the AM3+ platforms. The next update to the FX CPUs will be based around the Zen core architecture and will be feature on the AM4 platform which being a totally revised design, will adopt several key technologies such as DDR4 memory support and a decent feature set that reflects a true update on AMD’s product portfolio. Some details regarding the new FX CPUs will include high core count with full multi-threading support which confirms AMD is approaching Intel in design scheme and SMT has been rumored for some time now but now it can be officially confirmed. In addition to SMT, Zen also features a new high-bandwidth low latency cache system. A vital improvement over the previous generation of cores. Since subpar cache performance was one of the primary pitfalls of AMD’s Bulldozer CPU microarchitecture. 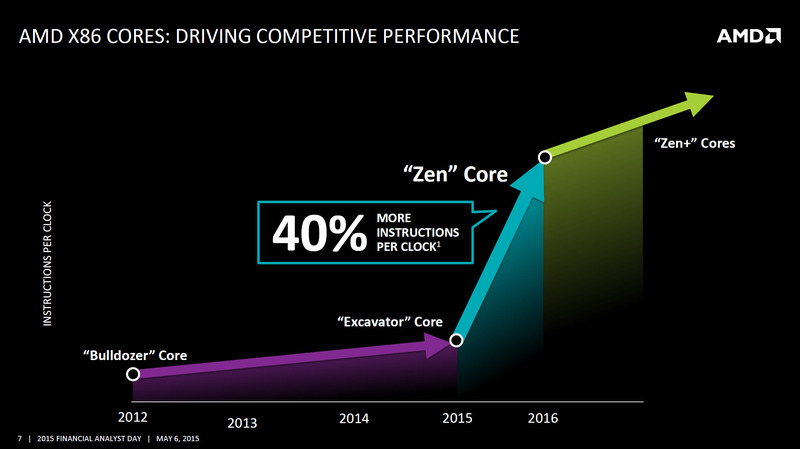 AMD announced that Zen will be available starting next year. The new CPU core will be fabricated on FinFET, however the company doesn’t specify whether it will be 14nm or 16nm FinFET however. 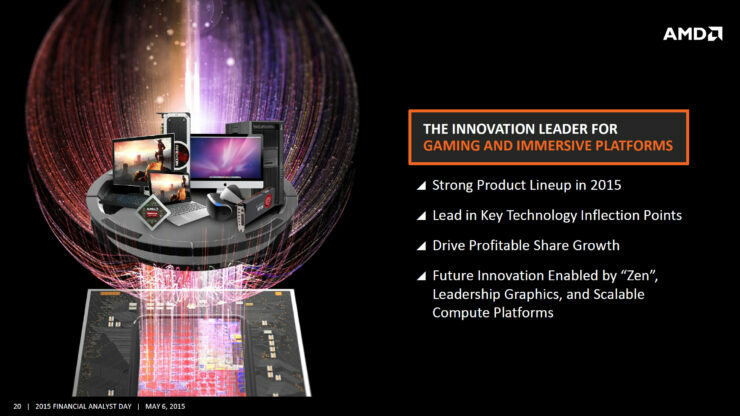 But we think it’s a pretty safe bet that it will be Globalfoundries 14nm. Now let’s talk about performance. Zen will be AMD’s successor to the Bulldoze family of cores. It will be the first ever CPU core from the company to adopt SMT , Simultaneous Multithreading. It will also the first entirely new CPU core after the company’s previous CMT, Clustered Multithreading design featured in the Bulldozer family. The Zen core delivers around 40% more instructions per clock (IPC) over Exacavtor core which is the single biggest core performance boost in a while from a processor making company. 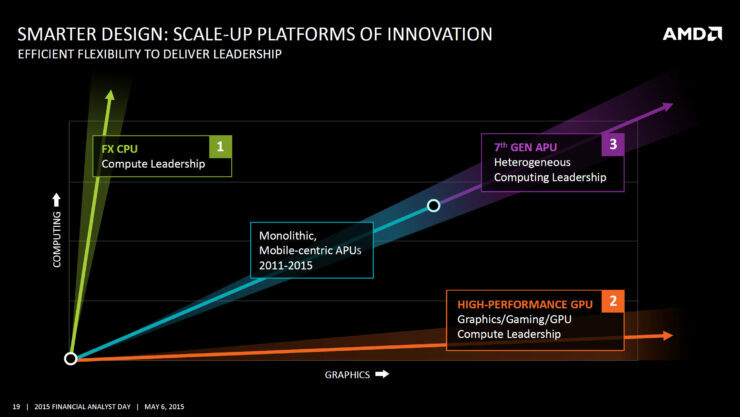 The more surprising bit is that AMD also confirms that 2017 will see the launch of faster and better Zen+ cores which will deliver even better performance per watt with around 5-10% further IPC improvements over the same core architecture. The last update in 2016 to the computing side would be the latest 7th generation desktop and mobility APUs which will be supported by the AM4 and FP4 platforms. AMD hasn’t given a run down on what exact core will the new APUs use but if anything makes sense, then these would be based either on Zen or a more optimized version of AMD’s x86 Excavator core architecture. 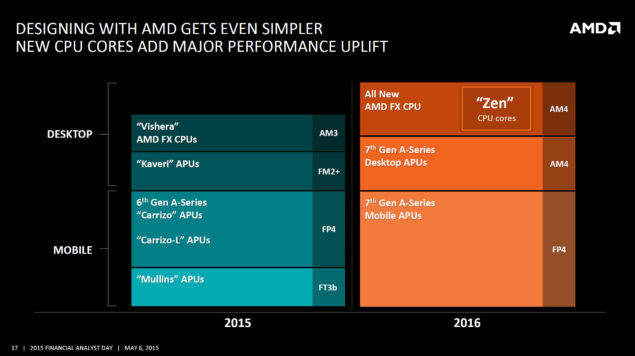 The interesting bit is that the AM4 desktop platform would only compatibility towards both the Zen based FX CPUs and 7th generation A-Series APUs. Some key details for these APUs include greater performance per watt efficiency gains, HSA 1.0 and OpenCL 2.0 support, DDR3 and DDR4 memory compatibility for specific platforms. If every thing goes smooth and fine, we will be looking at Zen going against Intel’s 10nm Cannonlake processors which will be using an architectural design, similar to Intel’s Skylake processors. On the high-end side, Intel will have Skylake-E up against AMD’s enthusiast Zen offering while there will be several mainstream and mobility chips up against the 7th generation APU lineups. AMD’s 40% IPC improvement sounds insanely good and there is no doubt that AMD will finally have a CPU worth looking forward to in a heated competition space.